Maintaining your home can take a lot of work. From keeping your carpets clean and your floors scuff-free to ensuring your countertops are stain-free and your bathroom is free of any germs can take a lot of work. Fortunately, with glass table covers from Affordable Glass & Mirror Co., we can help make your live easier by protecting your tables and keeping them looking fresh and clean no matter what. Wood Looks Great in Any Room! Wooden dining room tables and living room tables give any room a natural, homey look and feel. Wooden furniture is warm and inviting and makes it easy for you to decorate the rest of your room! Although wooden tables have many aesthetic advantages, they also need to be handled with care. Think of how often you use your dining room table or living room coffee table. You probably eat dinner at least every day at your dining room table, and you likely use the coffee table in the living room each morning while watching the news. Things like food, sharp objects, wet glasses and more are dangers to your wooden furnishings, though. Wood can easily stain, scratch, fade and show signs of water ring marks. Tablecloths, place mats and table runners are more for decoration than to protect your wooden surfaces. Although they add color and decorate to your living room and dining room, they won’t protect your wooden tables forever and offer only a minimal protection. To ensure your wooden surfaces remain free of any scratches, stains and water ring marks, you need something durable that’s still visually appealing. You need glass table tops. Glass table tops are a durable and attractive protection option that won’t detract from the natural beauty of your wooden furnishings. They are simply placed atop the surface to protect your living room and dining room investments. 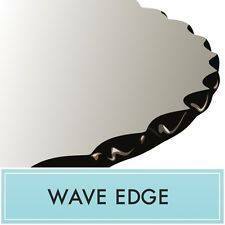 There are many different designs to choose from including tops with an ogee edge, flat polish edge, 1-inch bevel edge, wave edge and pencil edge. Compare the different styles side by side in our online inventory. If you want to keep your wooden tables looking flawless for many years to come, you need a glass table top from Affordable Glass & Mirror Co. With glass table tops, you’re protecting more than just your wooden surfaces; you’re protecting your investment. To learn more or to order your glass table top, call us today at 404-361-5151.